Sony has set out to captivate the advertising world once again with a new commercial designed to showcase the capabilities of its award-winning range of digital imaging products – including the latest models from its a, Handycam and Cyber-shot ranges. 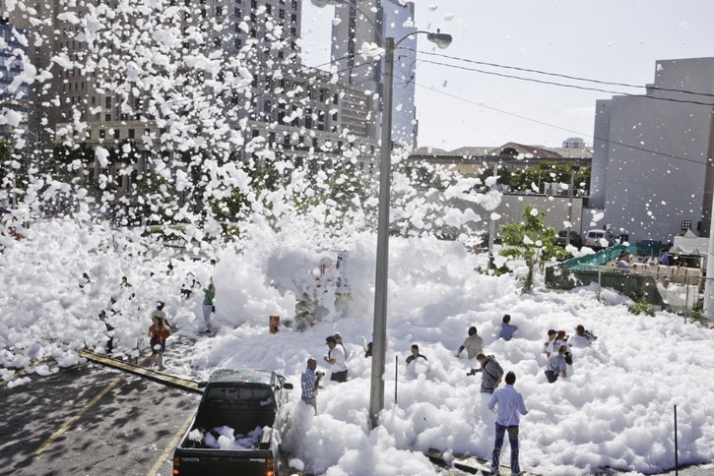 Shot in Miami, Florida, the advert, entitled ‘Foam City’, involves the Downtown area of the city being transformed into a foam-filled wonderland – with whole streets full of foam and bubbles. The world’s largest foam machine has been built especially for the ad, with over two million litres of foam being produced every minute. The ‘stars’ of the shoot are genuine Miami citizens who have been invited to enter the ‘Foam City’ whilst the cameras capture their every reaction to their new surroundings – especially when scooters, bikes and even a truck are driven through the foam-filled landscape! The inhabitants of Foam City are able to capture every single moment using a selection of Sony’s range of Cyber-shot digital stills cameras, Handycam camcorders and a DSLR cameras, and all the images taken over the course of the shoot will be uploaded to an online database - allowing people to not only re-live their own experiences but also share them with others. To provide further insight into the uniqueness of the Foam City experience, a documentary team has picked a variety of different groups and individuals to follow – including a Miami family – recording their time at the shoot and their responses to the extraordinary environment. Sony has turned to the same creative team behind the popular series of BRAVIA adverts – the ‘Balls’, ‘Paint’ and ‘Play-Doh’ trilogy - advertising agency Fallon London, for the shoot, which is being helmed by renowned director Simon Ratigan. The foam theme is being used across all digital imaging advertising activity, and, there will be product specific ads appearing in addition to the main advert - focusing on the different technologies of the new ranges. The a advert, for example, will focus on the challenge of capturing the perfect bubble. The foam produced for foam city is non toxic and biodegradable. Foam created is broken down quickly using a special spray (used in catering processes) to ensure minimal impact on local environment. Street cleaning machines used to remove any remaining foam and bubble residue at the end of each shoot day.